The senator’s choice was another that showed his trademark individuality. McCain, who died Saturday after battling brain cancer, selected the out-of-the-way spot over the grandeur and solemnity of Arlington National Cemetery in Virginia, where his father and grandfather — both admirals —are buried. Instead, the decorated Vietnam War veteran, former prisoner of war and six-term senator opted for a front-row position next to his friend Chuck Larson, himself an admiral and ally throughout McCain’s remarkable life. “Near, where our paths first crossed,” McCain wrote in his memoir of the site. McCain’s office said on Sunday that Larson, who died in 2014, had reserved four plots at the site — for himself, McCain and their wives, both now widows. From the grassy spot, the grunts and shouts of dozens of exercising midshipmen on Forrest Sherman Field float up to the grave site. 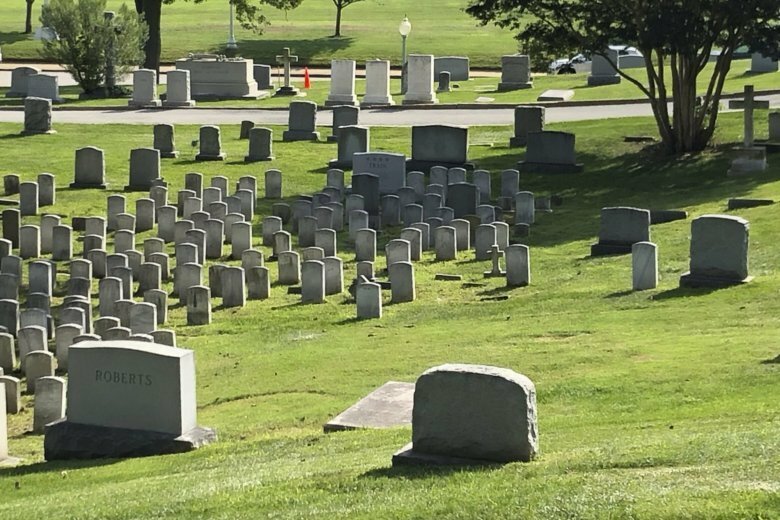 Beyond that, crew teams row by and around the peninsula that since at least 1868 has served as the Naval Academy’s cemetery. Boats sail past, and occasional car horns from the nearby Baltimore Boulevard bridge interrupt the peace. On Saturday, as McCain spent his final hours surrounded by family at his ranch in Arizona, his grave was already marked. “Sect 8 1704 McCain,” read a handwritten sign on a wooden post, noting the section and grave number, adjacent to Larson’s grave. In between two wooden stakes sat an orange traffic cone, a sentry that might have amused McCain with its unceremonious placement for a former presidential candidate amid the elegant, weathered gravestones. McCain and Larson’s friendship began at the academy, where McCain ranked near the bottom of the class of 1958. His best friend, Larson, finished near the top, receiving his diploma and personal congratulations from President Dwight D. Eisenhower. They were roommates through flight school. Larson went on to become commander in chief of military forces in the Pacific. He was the second-youngest admiral in history. Larson also was named superintendent of the Naval Academy twice, the last time in 1994 with a mission to restore morale after the largest cheating scandal in its history. McCain was shot down over Vietnam and tortured for five-and-a half years as a prisoner of war. After his return to the U.S., he was elected to the House in 1982 and the Senate in 1986. He ran unsuccessfully for president in 2000 and 2008. His rebellious nature sometimes frustrated his political allies and strained friendships. But Larson and McCain stayed “the closest of friends,” McCain wrote. McCain spoke at the academy as Larson, who died of leukemia at age 77, prepared to leave in 1998. Specifically, McCain was hosting a secretive party at which his crew watched a fight on television. Larson attended. When an officer approached, the partiers stuffed Larson in a crawl space. “I always like to remember Chuck that way, cringing in my closet, dressed in his formal blue uniform, his sword at his side….” McCain reminisced in public.